Most people have never heard about facial collapse. It may be due to the fact that this condition occurs so slowly, over the course of ten to twenty years. When there are no teeth left in your jawbone, your body senses that the bone is no longer needed to support the teeth. 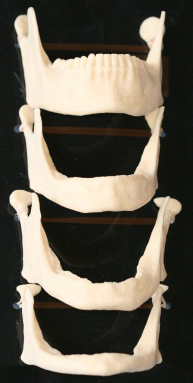 The jawbone is resorbed so that the minerals can be used in other parts of the body. So if you have had all of your teeth removed and wear a denture, you will experience facial collapse. Shown in the diagram to the left, which is courtesy of Dr. Carl E. Misch’s textbook, Dental Implant Prosthetics, you can see the different stages of this condition demonstrated. The bone loss progresses from the top image to the bottom, as the bone deteriorates. First, all of the teeth are present in the top image. Then, in the second image you can see that all of the teeth have been extracted. After that, the bone loss is very gradual. So much so that it could take up to twenty years to arrive at the bottom image. But in the last stage shown in the bottom image, the patient is considered a dental cripple. This means that it is very difficult and in some cases impossible to wear a denture anymore. Eating normally is difficult and if a denture can be worn it is very painful. The person’s facial appearance may also be shriveled and sunken in. As a result they’ll appear much older than they really are. The placement of dental implants can prevent the bone resorption that causes facial collapse. Bone loss will not occur in the area right around where the dental implant is anchored into the jawbone. Therefore, having as little as two dental implants placed per arch can go a long way in helping prevent facial collapse. Implants will eliminate the possibility of becoming a dental cripple. And the more implants that are placed, means increased stability for your denture, and even less bone resorption. To learn more about the many benefits of choosing implants, please visit our dental implants page. If you have any questions about facial collapse or about what the best treatment may be for you, you may schedule a complimentary consultation at (918) 742-5521. Dr. Noah will meet with you to help explain the pros and cons of dental implants and dentures. Our implant services are generally handled at our Tulsa Midtown location. If you prefer, you may click here to request an appointment online.